Joining a sea of wedding website builders is Say I Do, a relatively new service that offers a refreshing spin on the formula. With the platform’s simple and minimalistic approach, it’s clear from the get-go that the company aims to make website creation as easy as possible for soon-to-be-wed couples. Templates, meanwhile, are simple yet classy, and swapping out designs in the middle of editing won’t have you starting again from absolute scratch (meaning, yes, your content stays put). It’s unfortunate though that some advanced features, like guest messaging systems or video uploads, are nowhere to be found. More disappointing is the fact that designs are pretty limited in quantity, as well as customizability. Still, Say I Do is free forever, and it largely succeeds in providing couples a quick and easy way of setting up a functional wedding website. Ease of Use: Simplicity is one of Say I Do’s greatest strengths, and it shows in how easy to operate their website builder platform is. Classy Designs: Say I Do’s templates are pretty minimalistic, yet maintains a touch of modernity and class fit for any wedding. Change Designs Any Time: Unlike other wedding website builders, Say I Do’s builder allows you to swap out designs at any time without going back to square one in terms of editing your content. Free Forever: Say I Do offers a free plan that will stay that way forever – even when they introduce paid plans in the future. Lacks Advanced Features: Say I Do lacks some of the advanced features you can find in other wedding website builders, like music and video uploads, guest messaging systems, and the like. Limited Designs and Customizability: If you want your wedding website to be as unique as possible, you might want to look elsewhere as there are only a few designs available as of this writing – all of which offer very limited customizability. Say I Do differs from most wedding website builders in a lot of ways, but the most striking difference is the price of entry. Couples, set aside your wallets; taking full advantage of Say I Do’s services comes at no cost at all. That’s right – they offer a completely free plan that includes all the features on tap. That means you get their guest list manager, an online RSVP tool, Instagram and third party gift registry integrations, and access to all their themes. The best part? The free plan will stay that way, even if their planned paid subscription options launch sometime in the future. Plus, you don’t have to worry about any hidden charges. The features on tap may not be as robust as other companies’ offerings though – so there is a trade-off. 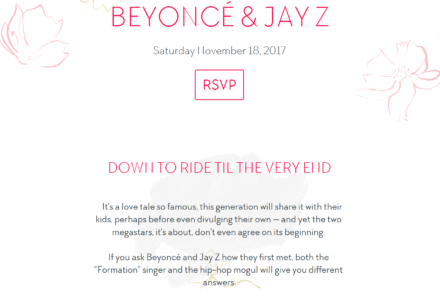 For the most part, Say I Do’s website themes look pretty classy – albeit a tad too minimalistic. Not that anything is wrong with that, but for those looking for themes with a bit more meat, this may not be the best wedding website builder for you. And for those looking for variety? There are only 5 as of this writing. It’s unfortunate that the company has only a few themes on tap, but that may change as the company launches their paid plans. Still, at least the ones on hand look pretty great – especially when you integrate your site with Instagram. Speaking of which..
Say I Do does not officially have a photo album feature – meaning you can’t upload photos as you would on any other wedding website builder. That said, in lieu of a photo album, the platform can integrate with Instagram and pull your photos from there. They accomplish this by simply looking for your wedding’s official hashtag (which you have to enter manually in your Say I Do dashboard). Once activated, your wedding site automatically displays all pictures bearing your custom hashtag. Of course, if you don’t have an Instagram account yet, you would have to create one first and upload your photos there before you can take advantage of the Instagram integration feature. This is not an exaggeration: creating a wedding website at Say I Do takes less than an hour. It’s that simple and intuitive. After signing up, you are redirected to your minimalistic, all-white account dashboard. The aesthetics scream simplicity, so those allergic to menu clutter can definitely breathe a sigh of relief. Navigating the dashboard is similarly simple – there are only 4 items in the menu, after all. Here you can easily access your guest list, your event schedules, your site options, and account settings. Adding guests to your list, again, is simplified. Before you can add people though, you have to choose whether to add a single guest, a couple, or a family. After picking any of the options, you can now add guests – a process so simple that you need only enter their names and choose whether they are guests of the groom, the bride, or a custom group of your making. Say I Do also makes event/schedule creation an absolute breeze. They provide templates for events, like the ceremony itself, the reception, or Sunday brunch. You can use any of the templates, or add your own from scratch. Then it’s all a matter of entering the venue’s address and the time – as well as other optional details like the name of the venue, your preferred attire, or a short description of the event. Created events also automatically pull up a map of the address you enter, which is a nice touch. Creating a website, meanwhile, involves picking a theme and entering content. You can also choose to hide or show individual sections of your site. So, if you don’t want, say, a section showing your gift registry, you can choose to omit it altogether. Beyond editing sections, however, there are no other customization options available to users. Other people might not like the fact that tweaking the site design to your liking isn’t possible at all, but for those who just want to get a classy wedding site up and running in no time, Say I Do definitely delivers. Getting in touch with Say I Do’s support team is accomplished via live chat or an online contact form. Phone support is nowhere to be found. If you want to troubleshoot on your own, or if you simply want to know more about their service, Say I Do’s knowledgebase should be able to fill you in. All in all, customer support options here are decent. What's the Verdict on Say I Do? Say I Do manages to differentiate itself from other wedding website builders in the field by keeping things simple. Sticking to a minimalistic approach all throughout, however, means that compromises will have to be made. Advanced features, more template variety and in-depth customizability are three of the most notable omissions here, which might turn off those who want more control over their wedding website. That said, because of their user-friendly approach, creating a website – from filling up your guest list to finalizing your schedule – is an absolute breeze. So, for those who simply want to create a fully functional wedding site in no time, and don’t mind the inherent simplicity of the platform, Say I Do is definitely a must try, especially since it is completely free to use.